“There” is the lower level of the sprawling building that was once the infirmary of the Brandon Training School. When husband and wife Stephen and Edna Sutton bought the place in January 2012 — for “just under $100,000,” Edna says — the task they faced was no joke. The couple had resolved to transform the building into a haven for the arts. “Then we realized how many millions it will take to renovate it,” Edna Sutton adds wryly. Since the institution closed its doors in 1993, the building had sat empty, prey to vandals and desecrators — never mind the detritus left behind. The lower level is clean now, Sutton says, but not yet presentable enough for a tour. Compass sits at the southwestern edge of this leafy campus, now called Park Village. To reach it you must enter from the north and wend around a curving drive from which Compass is not visible, keeping your eyes peeled for the small, temporary signs that guide the way. The land slopes downward, so the front of the brick building appears as a flat, single-story structure. That face is deceiving. The back, which opens onto a broad cleared area surrounded by woods, reveals two levels and a much larger size. Only when you go inside does the enormity of the building begin to sink in: It’s 52,000 square feet in a sort of cross shape, with long wings to the right and left, and a huge former cafeteria — now a gallery — in the middle. Wandering through the dingy halls, it’s easy to get disoriented, especially with the unsexy guts of the building exposed. “We’re putting in the HVAC now,” Edna Sutton says apologetically. But it’s easy to latch on to her enthusiasm as she describes what each room will eventually become. When the Suttons first visited the building, Edna says, “Stephen went one way and I went the other; he thought recording studio, and I thought classroom space.” Stephen is the owner of Divine Arts, a classical-music record label. Back in Yorkshire, England, Edna was the executive director of a local authority that oversaw education and social services. Despite the mess, a dream was born. And, like parents with a newborn babe, the Suttons focused on the building’s promise, gritted their teeth and began to tough out the dirty-diaper stage. Currently under construction are Compass’ music and art wings, each of which will offer rentable studios. Already finished are the gallery — which opened with a reception for abstract painter Roger Book last Friday — a gift shop and a small room with an exhibit on BTS history. In time, the building will hold a phonograph museum, café, music-listening room, performance space and whatever that creepy basement inspires. Edna Sutton also envisions “a sort of amphitheater space” and an outdoor sculpture park in the back. Compass Music and Arts Center has spawned a foundation — a nonprofit branch that will enable the Suttons and their board to apply for grants to help carry out their ambitious mission. That, broadly, is to support local arts education and development. “We want to be a working-artist community and learn from each other,” as Stephen Sutton puts it. He notes that he’d like to see instrument making and repairing, maybe even a music therapy office, sharing the spacious quarters. To think that the couple, when they first laid eyes on this building, had only been looking for storage for Stephen Sutton’s record label. The British label Divine Art began as something of a hobby for Stephen — in, coincidentally, the same year the Brandon Training School shut down across the pond. But by 2005, the label was successful enough that he left his job as a commercial and property attorney to focus on it full time. Divine Art merged with several other labels over the next few years, and it now offers a catalog of some 320 titles — a number that grows weekly. The focus is decidedly not on classical music’s greatest hits, but on lesser-known composers from centuries past right up to the present. In 2006, Sutton opted to relocate his business to Brandon. He and Edna had been summering in Rochester for 18 years but liked the looks of the “strong visual arts community, plus writers and singers” on the other side of the mountain, Stephen explains. Besides, renowned folk artist Warren Kimble had vacated his studio just outside town, on Country Club Road, and moved into the village. “We agreed to buy it and flew back to England an hour later,” Stephen recalls. The couple hold renewable five-year visas. For now, the Suttons plan to keep Brandon Music going, too. The renovated red barn houses a shop filled with CDs and gift items and a tearoom/café, which Edna oversees. It serves American and classic British fare on the second floor, where shelves of pretty teapots, cups and boxes of tea are both decorative and for sale. A grand piano and a cluster of mic stands occupy one corner of the airy, high-ceilinged room, evidence of the concert series that Stephen Sutton hosts — and often records — there. The acoustics, he says, are superb. Stephen recently acquired a pile of recording-studio equipment, which joins his own devices for audio restoration and the remastering of old recordings. His biggest delight seems to be discovering really obscure music, such as recently unearthed manuscripts by British composer Charles Avison “that had been lost for 250 years,” he says. Stephen plans an eventual “proper suite” for recording downstairs at Compass but says, “We want it to be somewhat mobile, so we can record in different spaces” in the building. Gale Parmelee of Otter Creek Media, who streams music at classicalvt.com from his office at Compass, represents the opposite end of the technology spectrum. The music includes recordings from Divine as well as other labels, Stephen says: “We’ll develop it bit by bit with dedicated programming.” As both a tenant of and partner with Compass, Parmelee “will help us develop the studio,” he notes. As for the recording projects he envisions at Compass, Stephen wants to “see what the demand is,” but he will probably stick to classical and light jazz, he says. Given his label and distribution connections, his legal savvy and his numerous accounts on iTunes, Amazon and the like, Stephen says, “We can do it all for [musicians] in one fell swoop.” He says he’d like to bring in students “to learn how to record” — though one wonders where he’s going to find the time. Indeed. In addition to running the tearoom at Brandon Music, Edna oversees the development of the café at Compass, not to mention the rest of “her” wing, and events programming. She works closely with the board and will become its president this week. Neither Edna nor Stephen Sutton seem to be planning retirement any time soon. But they’re not rattling around this old infirmary alone. The board is active, and the Suttons have hired Kathryn Marshall as exhibits director for Compass. The current exhibit most visibly expresses the potential of the arts center so far. 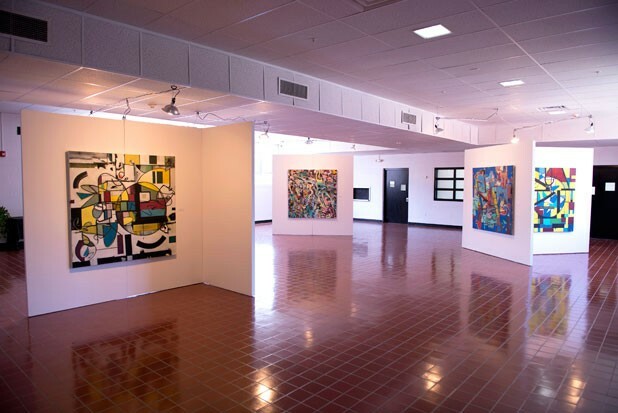 In that former cafeteria, with its white walls and terra-cotta-tiled floor, new freestanding display units now hold large-scale paintings by Boston-based artist Roger Book. The old room that was once filled with institutional tables and chairs has been transformed into a clean, minimalist and loft-like gallery. It’s as if all the building’s old, unpleasant memories have been wiped clean, too. As in Book’s vividly colored abstractions, everything is open to new interpretation.